Artists Comments: Quickly discovered that my new-found hobby allowed me to mix my three favorite things: company of friends, the beach and painting! 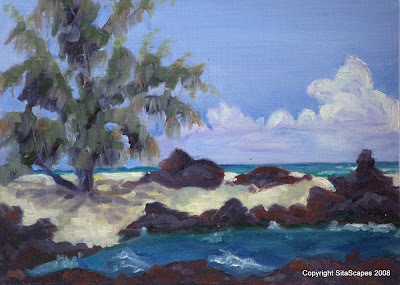 I packed my easel and supplies to take with me on a camping trip to Makalawena. What an awesome feeling to translate onto canvas the surrounding beauty.